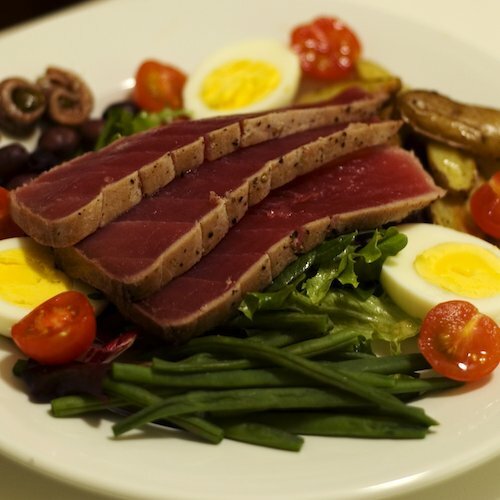 From the Kitchen: Grilled Steak Nicoise Salad | Stahancyk, Kent & Hook P.C. Score steak diagonally across grain at 3/4- inch intervals, generously seasoning both sides with salt and pepper. In a small bowl, whisk together lemon juice, mustard, honey, anchovy paste, and slowly drizzle in olive oil. Add salt and pepper to taste. In a large saucepan, cook potatoes in salted boiling water for 10 to 12 minutes or until tender; place the green beans in the same boiling water, cook for one minute. Drain and toss with 1/2 cup reserved vinaigrette mixture. Set aside. Grill the steak, covered with grill lid, over medium-high heat for five minutes on each side or to desired degree of doneness. Remove from grill, and let rest for 10 minutes. Cut diagonally across grain into 1/4-inch- thick slices. Toss the arugula with 1/4 cup remaining vinaigrette mixture, and place on four serving plates. Arrange steak, green beans, potatoes, tomatoes, olives, and egg on arugula. Drizzle with remaining vinaigrette mixture and serve immediately.